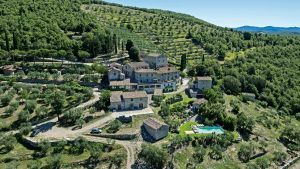 The Chianti farmhouse of Monteraponi, an ancient medieval hamlet, situated on the hill of the same name, once belonged to Baron Ugo, Marquis of Tuscany in the tenth century. It was not until 2003, however, that current owner Michele Braganti produced and commercialised the estate’s own bottlings. The vineyard had been in family hands since 1974 but the fruit was previously sold off to other growers. The vineyard area, all in the commune of Radda in Chianti Classico, spans 10 hectares. The wines are planted as high as 570 meters above sea level, some of the very highest in the Chianti Classico, on a mixture of hard Albarese and softer Galestro limestone soils. The wines are made in a traditional, low tech and gentle way. After hand harvesting and gentle pressing, spontaneous fermentation is carried out in cement vats where it continues to macerate and infuse with the skins for a further 25 days. The wine is then racked off into large used French and Slavonian oak casks for between 14-36 months of ageing depending on the cuvee, bottling then takes place without fining or filtration. These are some of Chianti Classico’s most exciting, vivid and age worthy wines. Still a relatively young project, it already seems as if Monteraponi and their brilliant wines have the ability to elevate the reputation of the Chianti Classico as a whole.